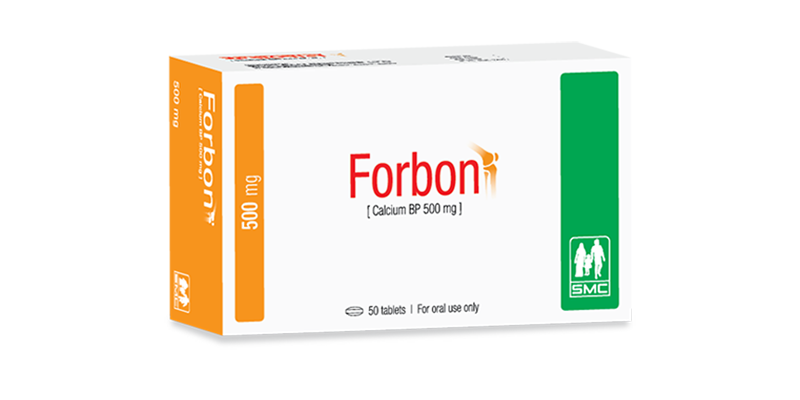 Forbon tablet: Each film coated tablet contains Calcium Carbonate BP 1250 mg equivalent to 500 mg of elemental Calcium. Calcium is an essential element and plays vital role in the body. It makes body's framework stronger by building bones. Clinical evidence suggests that calcium is useful for prevention and treatment of osteoporosis and associated fractures. Usual adult dose: 1 tablet in the morning and 1 tablet at night. Side effects of Calcium may include an irregular heartbeat, nausea, dry mouth, constipation, weakness, headache, a metallic taste in mouth, muscle or bone pain and drowsiness. Pregnancy and lactation: Calcium should be used considering the risk benefit ratio. Caution should be taken in patients with renal impairment, sarcoidosis, hypercalcemia and hypercalciuria. Keep out of the reach of children. Keep below 30°C, protect from light. Forbon Tablet: Each box contains 5 x 10’s tablet in blister pack.